Members of the Great Britain team arrived back in the United Kingdom from China on Monday following their best Olympic performance for 100 years. British competitors won 19 golds in Beijing to finish fourth in the medal table with a haul of 47 medals. 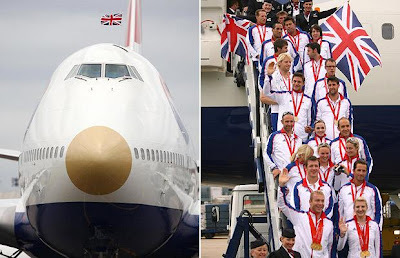 The team landed at Heathrow Airport on a dedicated British Airways Boeing 747 featuring a special gold medal "nose". The biggest cheer was saved for the first sight of all the gold medallists led by Becky Adlington and Chris Hoy. While the majority of athletes were reunited with their families at a hotel, some of the British stars attended a news conference. Team GB chief Simon Clegg said: "It's been a long campaign and the whole team are really pleased to be back home and very proud with what has been achieved. "It's really difficult to gauge the mood of the public, but no one expected the level of this reception here." 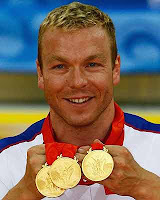 Hoy, triple gold-medallist in the velodrome, said: "It's quite overwhelming. It's an incredible reception. You're living in a bubble in the Olympic village and it's only when you land and see quite how many people have turned up you realise - it's incredible. "It's been a long pressure build-up and it's going to be nice to switch off and see friends and family and do normal things again." The 32-year-old Scot, however, laughed off suggestions that he may now receive a knighthood. "I think that's ridiculous to be honest, it seems crazy." The Princess Royal was one of the first to step off the plane, followed by Sebastian Coe. The London 2012 chairman, who now leads the drive to the Olympics in four years, said: "Those guys just performed way beyond what we expected." Adlington, gold medallist in the 400m and 800m freestyle and Britain's first female Olympic swimming champion in 48 years, revealed she will now relax with her family and boyfriend and return to the pool at the end of September. "I'm having a month off and then getting back in the water," the 19-year-old from Mansfield said. "I just can't wait to get home and see my family." Her victory will also be toasted in the Adlington Arms, after it was announced the local Yates's pub would change its name in her honour. Kelly Sotherton, who missed out on a medal in the heptathlon, said: "My London training cycle started the day I left the track. As soon as I won my medal in Athens I was preparing for Beijing and London is only four years away. "We had a great Olympics, but I'm sure we'll move on and be more successful in 2012." 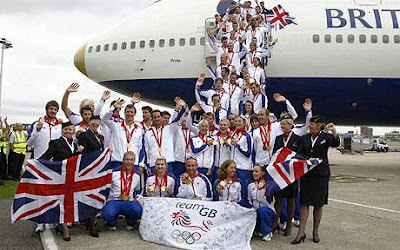 The plane, renamed Pride after the British Olympic lion mascot, had the message "Proud to bring our British heroes home" emblazoned on the fuselage. And there was some extra weight on the inbound flight too - 44lb of additional metal, in the form of Olympic medals. Extra champagne was ordered for the flight and the airline gave the medallists special upgrades, although it was reported that many athletes requested apple juice. Unloading their baggage was a job in itself - there were 700 pieces of equipment on board, including 80 bikes, six javelins, and four canoes. 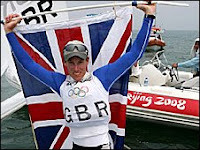 Captain Alasdair MacFadyen said: "We've all been following Team GB whilst they've been in Beijing. "They've done the UK proud and we're so pleased to be delivering them back to home soil to the heroes' welcome they've earned." Organisers had warned fans to stay away from the airport and said the public could mark the homecoming at a victory parade in London on 16 October. A reception at Downing Street is also likely to be arranged. Prime Minister Brown has already stated the honours system will recognise the team's achievements. The British Olympic Association had targeted an eighth-place finish in the table. But despite some below-par displays in athletics and equestrian events, excellent performances from the swimmers, rowers, sailors, boxers and canoeists helped Team GB finish above the likes of Australia and Germany. The cyclists won a total of 14 medals, including eight golds, with Hoy's efforts making him the first Briton in 100 years to win three golds at the same Games. The rowers picked up two golds, two silvers and two bronzes for their best Olympics since 1908 while Britain 's sailors will have a hard act to follow in 2012 in Weymouth. They won four golds, including a third for Ben Ainslie, who was elevated to the same status as record-breaking swimmer Michael Phelps and sprinter Usain Bolt by Olympics chief Jacques Rogge. Britain's boxers also did well, with James DeGale adding gold to bronzes for David Price and Tony Jeffries, while Tim Brabants picked up the country's first ever canoeing gold. Despite a magnificent 400m gold for Christine Ohuruogu, the athletics team disappointed overall, falling one short of their target of five medals. "It has been frustrating - we almost hit the target, but you don't get medals for close," said UK Athletics performance director Dave Collins. Prime Minister Gordon Brown has already said the British government will be investing heavily in the country's sporting talent in the build-up to 2012. "As we move up to it we want more and more young people in Britain interested in sport," he said. "That is why we will be investing more in sport in our schools, as well as for our elite athletes." Well done to your team GB Rolly. See you in 2012.